A recent increase in the number of Barrett's esophagis being diagnosed is probably directly related to a proportional increase in endoscopic biopsies of the esophagus and awareness of premalignant potential of Barrett's mucosa. While the endoscopist can detect Barrett's mucosa with fair degree of accuracy, the radiologic diagnosis of Barrett's esophagus still remains a diagnostic challenge despite several well established radiologic features. 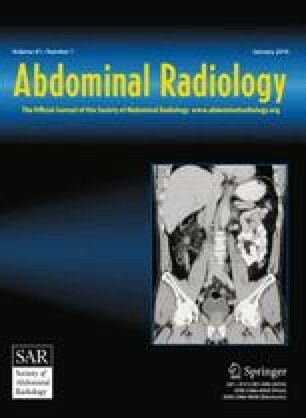 We reviewed 65 patients with pathologically proven Barrett's esophagus and found a wide spectrum of radiologic features. These include hiatus hernia in 49, gastroesophageal reflux in 38, strictures in 32, esophagitis in 20, and characteristic Barrett's ulcer in 12. In addition ascending or migrating strictures were found in 10, mucosal pattern simulating areae gastricae in 5, cricopharyngeal dysfunction in 4, and fixed spiral folds in 3 patients. This constellation of radiologic features, some of which have not been previously emphasized, should further assist radiologists in suggesting the diagnosis of Barrett's esophagus.